The vast majority of wrist watches, from their very conception, have a crown on the right hand side of the case, at 3 o’clock. Most crowns protrude from the case, where they are grasped for setting and winding of the watch, if the watch is of the mechanical variety. 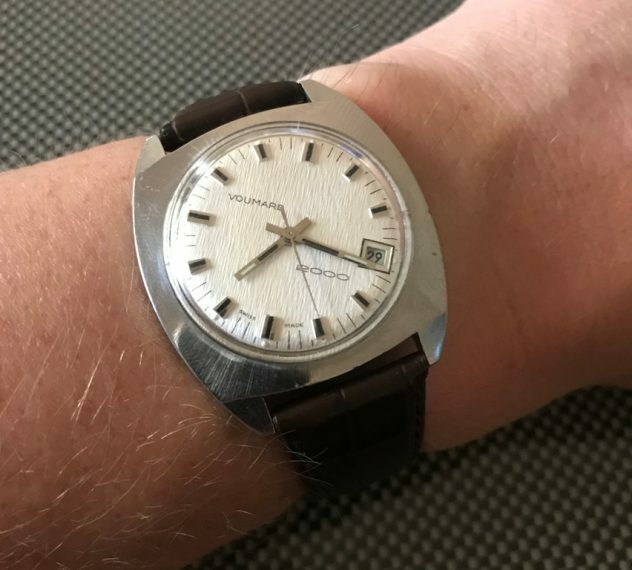 However in 1953, Jaeger LeCoultre released the Futurematic, with the technically impressive calibre 497 bumper automatic movement. What was different about the Futurematic, lies in how the watch was set – there was no crown to be found at 3 o’clock. 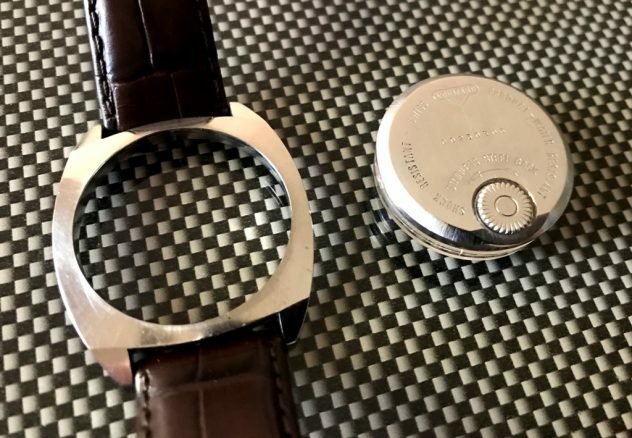 This watch was the first ‘back-set’ wristwatch, a true innovation where the tiny coin-like crown was located flat against the back of the case, in contact with the wrist when worn. The crown would slide one way to be rotated for setting the time, and then was slid back to its original position to get the movement going again. Being an early bumper automatic without a conventional crown, the Futurematic was not able to be manually wound. Jaeger LeCoultre reportedly lost money on the early Futurematics due to their over engineering and production costs. About 10 years later, Voumard Montres SA (based in Neuchâtel, Switzerland at the time) started developing their own oddity – the Voumard 2000. 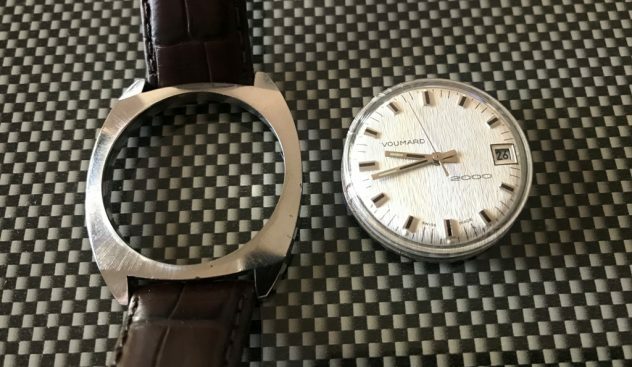 Voumard’s design differed from Jaeger LeCoultre’s, because not only was Voumard’s back-set, it was also back-wound, being a manual wind watch powered by Voumard’s own calibre 2500. Whilst the calibre 2500 won’t trouble the likes of Jaeger LeCoultre in terms of beauty or finishing, it runs smoothly and accurately, and has an impressive 54 hour power reserve. 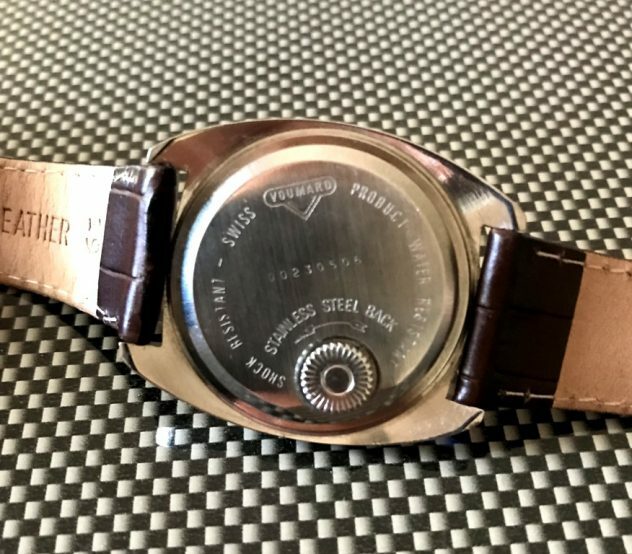 The operation of Voumard’s crown also differed from Jaeger – to wind the watch you rotate the crown wheel in one direction, as indicated by the arrow engraved on the caseback, by drawing your finger across it. To set the watch, you lift the crown up (to one click position) and draw your finger across it to set the hands. The crown is then pushed back down into its fully flat position. This movement also benefits from a rather rapid quickset date function. The Voumard 2000 is also a true modular construction, with the entire caseback/movement/dial structure popping out through the back of the case with a simple push. 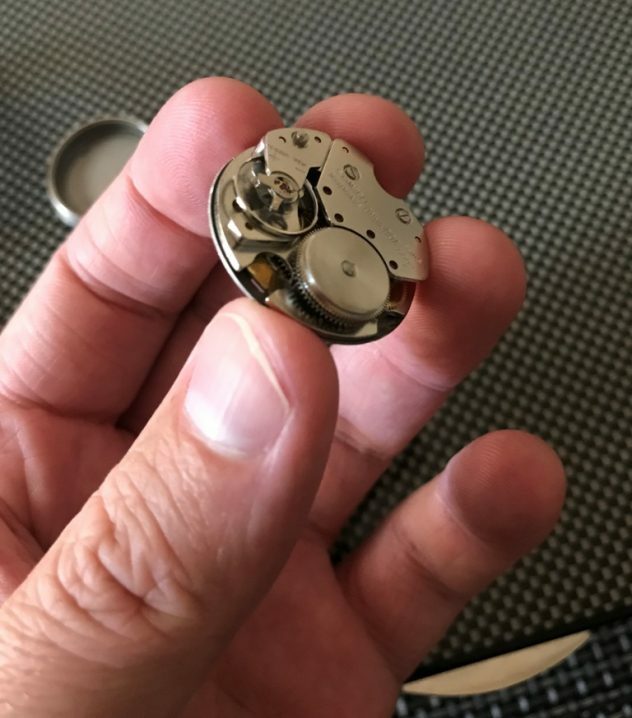 The movement and dial then separates from the caseback, and even the crystal can be separated from the dial with ease, again without the need for any tools. 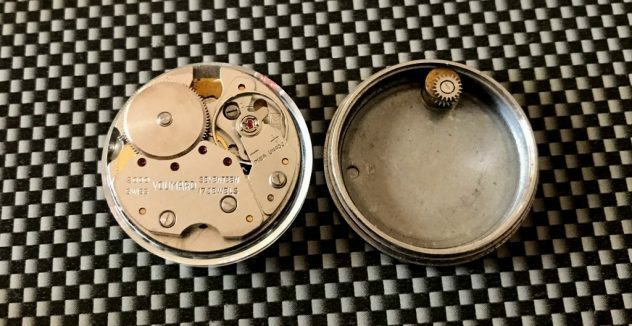 Great for amateur watch enthusiasts wanting to have a good look at the different components of the watch, without having to trouble a watchmaker! Having a rotatable dial within a crownless case means the Voumard 2000 can also be classed as a true ‘convertible driver’s watch’ – where the wearer can rotate the dial to an angle more easily visible whilst gripping a steering wheel. With its high quality textured parchment dial, the Voumard is indeed a pleasing sight on the wrist. An accurate history of Voumard is not easy to determine. The Voumard name has been present in the Jura region of Switzerland since the early 1800s, in the manufacture of clocks, watches and watch cases. 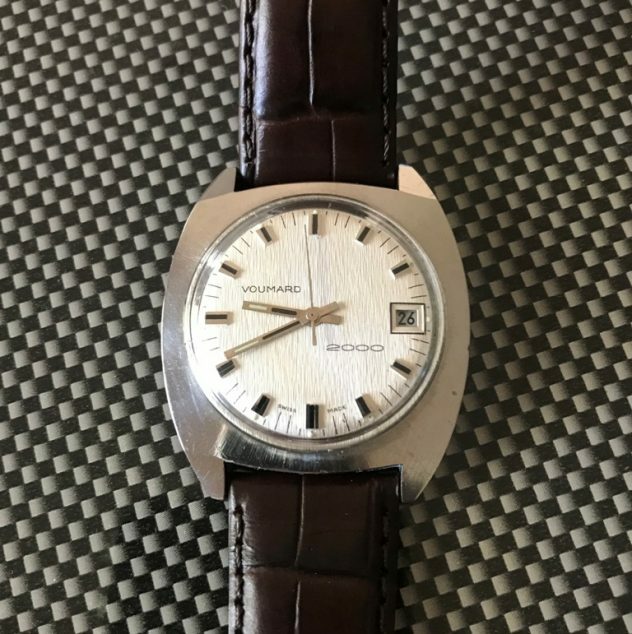 Voumard Montres SA were responsible for a very large number of brand name registrations and partnerships with other brands dating back to 1941; whereas original Voumard 2000 watch boxes can be found with “Voumard Since 1848” printed on them. The brand remains somewhat of an enigma, which is all part of the intrigue of vintage watch collecting!